So I’ve been thinking a lot lately, not only about what I want to get accomplished in the coming year of 2015, but also about all of the things that I ddin’t get accomplished in 2014. I know that you can not dweel too long on the past and mistakes that were made and I try not to but when I think of how many opportunities and time I let go by without achieving all that I had set out to this year I feel slightly disgusted with myself. It wasn’t even the fact that there was a lack of ideas or even motivation to get them done. It’s simply that there was much more procrastination and fear and not nearly enough action. I am taking steps to try to put an end to the need to procrastinate and to put some extra motivation into my drive to get the things I want accomplished for my brand completed. I’m starting with taking some steps into getting myself a business/book coach. Someone who can help steer me in the right direction, to correct whatever it is that I am not doing right, and to give me that nudge that I definitely need and hold me accountable to what I say I am going to do. A coach will also help me with my issues in regards to focus because I tend to think of a million ideas at once and actually believe that I can multi-task and work on all of them at the same time but in reality that puts me in the position where I actually get little to nothing done. I’m trying to map out my plans for the year 2015 and I don’t want to get overwhelmed with the actual process of mapping out my goals that I don’t actually even sit and write them down (which is the point I’m getting to now). I do this at the end of every year, sit down and list my goals and plans to attain those goals, and the task has never been so hard and so daunting, but as I think of how much time I have wasted not putting enough action into my plan for success it fills me with a sense of urgency to cram the last few years of unaccomplishments into one. I know that I don’t have to do that but I feel like time is something that none of us is sure just how much of it we have left to fulfill our dreams. I have said it before and I am probably going to keep on saying it until it actually proves to be true but this year is going to be the year I get things on track and going in the direction it is meant to go in. Success is not just something you strive for with planning out what you want. With a plan there has to be action to follow, a lot of action, and you can not allow procrastination to settle in because it is hard to get rid of. So how are your plans for the coming year shaping up? 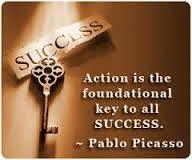 Are you prepared for the amount of action it will take to achieve them?